What is Junk Traffic And Is There Anyway to Turn it Into Gold? Too often, quantity is viewed as being higher than quality. In internet marketing, this can come in the form of junk traffic which is perceived to be a “good” thing by inexperienced people. Unqualified, bad, garbage and irrelevant visitors. It all refers to junk traffic. What exactly does it mean and why is it so dangerous? Junk traffic generally refers to visitor packages that you buy from different websites where you’re offered tons of hits for a very low price. In other words, you buy the option to have whoever or whatever you purchased from send people to your website. Now you’d think this is great since for low or high prices, they can just buy “unlimited traffic” and then their success is guaranteed. Note: The opposite of this is targeted traffic (or laser targeted). A) Bots which are not even real people landing on your page which will count as a “person” coming to your site, but it won’t lead to anything since bots aren’t an actual person, thus they can’t do anything on your site to give it value (leave a comment, buy from it, share it with friends). Thus you get nothing out of this but an illusion that your website had someone visit it. Your website will never succeed from bots coming to it. B) The actual “junk” traffic which is people who have in most cases absolutely NO interest in your website. They landed there because the person you purchased from may have sent out an email blast to their list telling them to visit your site, but unless you narrow down the type of audience that comes to your page, in most if not ever case, not a single person who sees your website will do anything through it, just like bots. In the end this package you purchased leads to nothing…but an illusion. And you should know this type of stuff is sold to people everywhere. It’s sold to bloggers like me through people and bots coming to it and leaving me messages to buy their “traffic” software so I can make money. This is called comment spam. Luckily if you have a few special plugins installed, they can wipe out 99% of it all automatically and they are free! In MANY cases, inexperienced people also go out and actually LOOK for this stuff. They are basically asking themselves to get scammed! One unfortunate example where you can find and buy these types of services is a place called Fiverr. In general, it’s a great website that provides essential services for online businesses (web design specialists, banner creators, programming help, ect…) and it does it through private individuals going there and offering those things for a small fee. However, while there are a lot of great things sold there, there’s also a few that I believe aren’t and one of them are people who sell those visitor packages like the ones I mentioned that give you those that bad traffic. I like Fiverr for a lot of the things they do, but they need to clean this part of their website up. I also recently had a comment from a person who asked if my #1 recommendation can help him. But part of his comment besides what he asked was also that he used one of those services I talked about and didn’t make any money out of it. While it is anecdotal, I actually see these types of testimonials a lot from people who use junk traffic. The danger of using this stuff is that it makes people waste money, get $0 out of it, and very often quit their businesses. If they just didn’t fall for that scam, they could have possibly been very successful! So it’s very important that you understand how to “gauge” if the visitors who come to your page will buy or not. We know what the first one brings, but the quality traffic, the other side, is what you always want on your page if you want to make money. And the best way to gauge that is by using the relevancy theory. Coincidentally, you’ll notice that the post I linked to talks about making more money. Trust me, if you’re trying to do that with your page, you need to read that and understand that attracting quality audiences to your page is the ONLY way for it to ever become successful and how to do it. 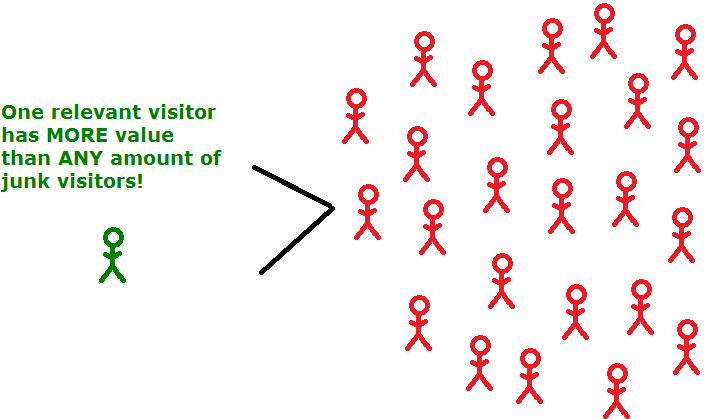 With junk traffic, the rule of thumb is that it’s the most irrelevant visitors possible and therefore completely bad for making money with. Therefore if you ever see offers and services which say they’ll send your website visitors for a low price or even a high one, chances are it’s just going to be junk and should not be purchased. The ONLY time you should ever consider buying traffic is if you are in control of who comes to your website and there’s a way to do that which we’ll discuss (example 2 below). But if you’re not in control, don’t know who they are or what their interests are, consider it to be the bad traffic which you shouldn’t buy. Lots of visitors coming in, no one doing anything I want and I end up losing money. All I received for my tons of visitors was more problems. While the title of this post was if you could turn this stuff into gold and all this time I’ve been saying no, there are SOME very rare yet mostly bad examples of when it can happen. I really recommend you only focus on the first 2 if you ever plan on using this. Example 1: Sending friends and family to your website when they are not your niche audience and have no intention of buying. People often do this, also view the visits they get from these people are being a sign of success when in fact, it is nothing but support. The ONLY thing people of this category can offer your site is if they spread the word by sharing it with their other friends and even then the visitors you get from this may also be junk. However, if you don’t have to pay for it, it’s not a problem. You should share your content with friends and family. Example 2: This is that rarity I mentioned above where if you BUY traffic and are in CONTROL of who lands on your website, then you have a chance of making this work! This type of method can work through what is known as PPC and it can lead to either you getting good quality visitors, bad quality or even both. What determines which ones you get is parameters you set. You’re going to be creating ads and displaying them on search engines. That is PPC. To get the most qualified visitors, your goal would be to target the most relevant keywords to have the right people land on your site. Now I did say MOST relevant, not least or even somewhat, because each of these versions leads to different results. I always aim to get the most relevant people on my site which gives me the best chances at making money. While PPC fails for most people, it works for me because I always follow theses crucial guidelines. Note: These first 2 examples can technically be considered to be examples of when you can turn junk traffic into gold because in one case, you don’t pay for it and in the other, you do pay, but because you’re in control of the types of people who land on your site, you can make it work. I have done it many times before using both these options. The other examples below are unfortunately the worst kind of junk traffic examples. The worst because they can involve either you selling these bad methods that we’ll go over to others which is basically scamming or using it for your own website to make money which again, won’t work. Example 3: You buy REAL junk traffic to give yourself or a possible client the illusion that your site or their site will be popular. This actually happens a lot. Many people who have access to these bad services visit business owners or email them and show off how quickly they can give them visitors by giving them stats on example websites of theirs when in reality all that page has is just junk traffic coming into it, but unfortunately, in many cases, it’s almost impossible that the people they’re pitching/showing it to will ever know about that stuff. That’s basically scamming. Thus far, I have shown you how to avoid getting scammed by it, but in this example, I want you to avoid USING it to scam other people. Example 4: Then there’s things like pay to click (PTC, not PPC) websites which have become the kings of the junk traffic world, yet they’re still going. Look at Click Intensity as the perfect examples of what a PTC site looks like and why they can be very bad. Example 5: I once saw a person boast that he was making close to a $100 a day by buying junk traffic and then sending the people he’d get from it to his site where he was putting up ads and making money from each click. However, that same person also turned out to be a massive scammer so I don’t have much faith in this method. Like I’ve said before, junk traffic is nothing but an illusion. There really is no “but” in this topic if you ask me. If you’re buying traffic and you don’t know where it’s coming from, or have no control over what types of audiences (or bots) are going to be coming to your page then odds are you’re buying junk traffic, aka garbage. And if you do decide to start engaging in the business of selling this stuff to other people who think it’s something real, you have no ethics whatsoever. It’s basically a form of counterfeit when I look at it because what you do offers nothing but an illusion of wealth. So whether you have 1 irrelevant visitor, 100, 1,000, even a million, it doesn’t matter, it’s always going to be bad in the end. Would you really want to buy garbage? Because that’s what you’ll get (from a digital perspective since it is online) if you buy this stuff. I’d also like to add one final piece and that is that junk visitors aren’t actually “bad” people, they are just the LEAST likeliest to buy from you and therefore, you should not try to get them to your website if you can. If they find it on their own, maybe through search engines, or a friend linked your site to them, that’s OK.
My website, through SEO actually gets a portion of it’s daily visits like this and even bots. It’s something every SEO website will get, but again, it’s OK. The point is that it just becomes very bad if you do nothing but buy that stuff, expecting it to be good. In fact, not even a little bit of it is ever good so just never get it! I really do hate “junk traffic” with a passion because I have fell for traffic exchange programs many time, that had delivered nothing but visitors who weren’t interested in my website, in the slightest! I can certainly relate to everything you are saying here on garbage visitors, and I’ve also tried Fiverr in the past too because I paid $5 for supposedly 1,000 “targeted” visitors from an email list. But after checking my website’s stats, they were delivered from several traffic exchanges instead! Thanks very much for your insights, and “value” is now something I’m aiming for when it comes to traffic. Thank you, Vitaliy. Yes, I have purchased traffic from Fiverr and found it to be useless, as well as other so called traffic packages. You reasoning struck a chord with me and l look forward to reading your post on PPC as it looks like that is the way to go. 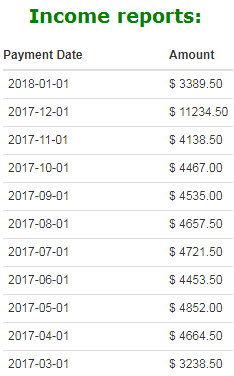 Before joining WA last year, and with another online business venture, (which ended up failing) I was suckered a few times into buying traffic packages, (even exchanges) such as those that you discussed, all of which promised that I would get real people visiting my website who were truly interested in the product that I marketed. However naive then to understanding what really goes on when purchasing these scam packages, and as you stated there were plenty of instances when my “traffic” was not actually real “people”. I’m sure I had plenty of “bots” visiting my site, disguised to be people and not in anyway about to provide me with sales. The other issue as you mentioned is a failure to get targeted traffic when purchasing many of these bogus packages. A person not into your niche who happened to be re-directed to your site would represent 0% chance of a sale being made. You presented a tremendous article to the person who does not fully understand the importance of getting targeted traffic in order to eventually make sales in an online business. Thank you for crafting it, Vitaliy!